enior guard Zach Johnson scored 24 points, including a follow-up dunk with 0.2 seconds remaining, as Miami pulled out a 78-76 victory over Fresno State on Friday in the semifinals of the Wooden Legacy Tournament at Cal State Fullerton. FULLERTON, Calif. (AP) — Senior guard Zach Johnson scored 24 points, including a follow-up dunk with 0.2 seconds remaining, as Miami pulled out a 78-76 victory over Fresno State on Friday in the semifinals of the Wooden Legacy Tournament at Cal State Fullerton. 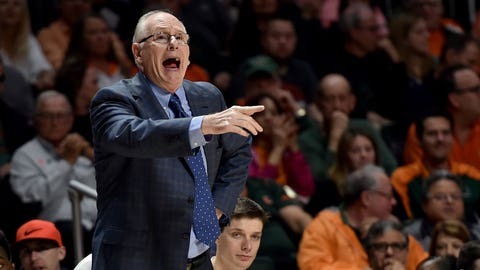 Sophomore guard Chris Lykes added 17 points and junior guard Dejan Vasiljevic added 12 as the Hurricanes (5-0) broke a 76-76 tie when Johnson rebounded a Lykes miss and slammed home the winning basket all in one motion. Lykes and Vasiljevic have scored in double figures in every game for Miami this season. Senior guard Braxton Huggins scored 28 points for Fresno State (2-2), while senior guard Deshon Taylor added 25. Huggins’ 20 first-half points were tied for second-most in a half in the tournament’s history. Fresno State lost despite a 43-29 rebounding advantage. Miami advanced to Sunday’s Wooden Legacy Tournament championship game where it will face wither Seton Hall or Hawaii.